Pyxis Technologies designs and builds industry standard fixtures and tooling for a wide variety of custom applications. All work is done to exact customer specifications. 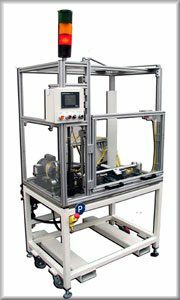 This mono-tube cutoff machine cuts the mono-tube in half creating two strut tubes. This machine uses 1 electric motor and a heavy-duty pipe cutter wheel.